Cannibinoids interact with one another to provide different medicinal effects. Based on the understanding of cannibinoids, dispensaries like OUTCO administer a variety of cannabis medications. 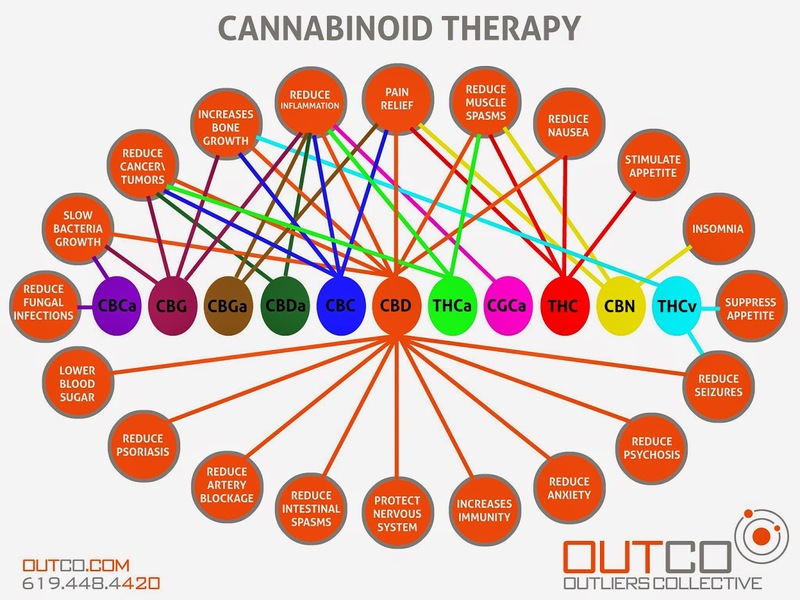 Listed below is the different cannabinoids and their specialized treatments. Tetrahydrocannabinol (THC) – The psycho-active cannabinoid that treats pain, nausea, muscle spasms, anxiety and increases appetite. Cannabidiol (CBD) – The most beneficial cannabinoid aiding in pain, slowing bacerteria growth, reducing sugar levels, nausea, reducing seizures, inflammation, insomnia, artery blockage, cancer cells\tumors, psoriasis, muscle spasms, anxiety, osteoporosis, increases immunity, spasms in intestine and protecting the nervous system. Cannabigerolic (CBG) – Reduces bacteria growth, inflammation, cancer cells\tumors, and osteoporosis. Cannabinol (CBN) – Mildly psycho-active that treats pain, insomnia, and muscle spasms. Cannabichromene (CBC) – Has been shown to reduce pain including migraines, inflammation, cancer cells\tumors and osteoporosis. Tetrahydrocannabivarin (THCv) – Mildly psycho-active that gives a euphoria and intensifies THC. Known to help with weightloss, reducing seizures, and osteoporosis. THCa – Known to reduce inflammation, cancer cells\tumors, and muscle spasms. CGCa – A cannabinoid known to reduce inflammation. CBCa – Slows bacterial and fungal infection. CBDa – Reduces cancer cells\tumors and inflammation.